Aside from winning national championships and bringing in top recruiting classes, the NFL Draft is a very special moment for Nick Saban. 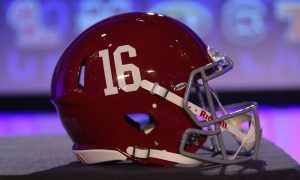 The head coach for the University of Alabama football program uses this venue for more than just a recruiting tool: he truly likes to see his players get selected as high picks and move on to create success as professional athletes. As we have entered the season of mock drafts, different analysts test their skills in seeing if they can predict the draft correctly. 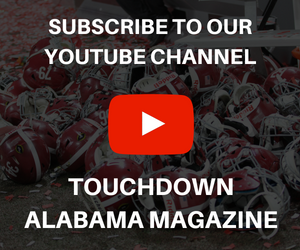 While most have the Crimson Tide placing three to four standouts in the first round, Stephen Smith of Touchdown Alabama Magazine sees five in round one. Listed below is his Mock Draft 1.0 in terms of former Tide stars. 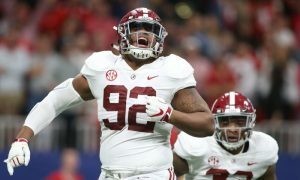 Despite him being regarded as an elite offensive mind, it would be very tough for Kliff Kingsbury to pass up a chance to help his defense in getting Quinnen Williams with the first overall pick. The 39-year-old is a division where he has to face Russell Wilson, Jared Goff and Jimmy Garoppolo twice a year, and the Cardinals need someone on defense to affect them. Chandler Jones led the team in sacks (13) last season, but the former New England Patriot needs help around him. Listed at 6-foot-4 and 295 pounds, Williams needed one year to show college football and NFL analysts on why he is better than Ed Oliver. He led Alabama in tackles for loss (19.5) and quarterback pressures (12) in 2018, while being among the team leaders in total tackles (71) and sacks (eight). Arizona does have Robert Nkemdiche, but Williams has proven to be the ultimate disruptive. He would make the most since for Kingsbury here. Kirk Cousins finished in the top-10 in passing yards (4,298) and touchdown passes (30), but he also sacked 40 times last season. Minnesota missed the playoffs and while boasted two 1,000-yard receivers in Adam Thielen (1,373) and Stefon Diggs (1,021), the franchise could not produce a consistent rushing attack. Even with players as good as Dalvin Cook and Latavius Murray are, the Vikings were 30th in rushing offense. Drafting Jonah Williams works here. Regardless of the noise in stating how he is not a first-round type at offensive tackle, he along with Barrett Jones were the two guys that Nick Saban trusted in that role at Alabama – despite both being under 6-foot-6. Williams, a native of California, started in 43 games as a tackle (28 at left tackle, 15 at right tackle) and grew into becoming the most consistent one. He missed just three assignments in 847 snaps at left tackle in 2018, grading out at 90 percent or better in 14 of 15 games. Williams did not allow a sack last season and anchored a group that surrendered less than one sack per game (0.93) — which ranked eighth in college football and first in the Southeastern Conference. 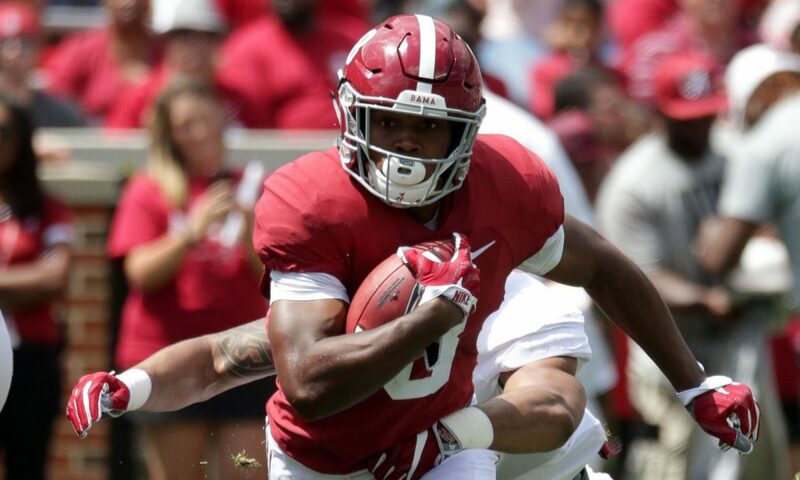 Behind him, running back Damien Harris was a two-time 1,000-yard rusher (2016, 2017) and Tua Tagovailoa became the fourth quarterback of the Saban era to pass for at least 3,000 yards. He recorded 3,966 yards with 48 total touchdowns, en route to earning recognition as a Heisman finalist and consensus All-American as a sophomore. 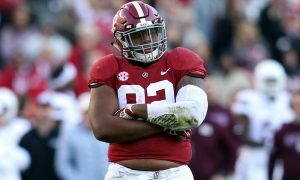 Williams was one of two unanimous All-Americans (Quinnen Williams, the other) for Saban’s 2018 unit and won the Jacobs Blocking Trophy for the SEC. The 6-5, 301-pounder may not have the best of wingspans; however, he is the soundest technician of this offensive linemen class. The ability to successful run the football is what gives Doug Pederson’s offense the flavor it needs to offset defenses. Versatility at the running back position is what made Philadelphia very attractive in the past. Seeing names such as Brian Westbrook, Darren Sproles and LeSean McCoy all turn in major numbers is what provided the Eagles with swagger in recent years. With Carson Wentz being the future of the team at quarterback, Philadelphia needs to regain some juice in its backfield. 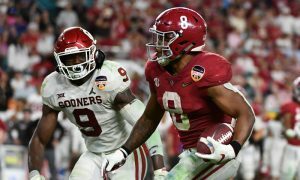 Rolling the dice on Josh Jacobs makes a lot of sense. The 5-foot-10, 216-pounder amassed 1,491 yards rushing in three seasons at Alabama with 15 touchdowns – including 640 yards and a team-high 11 scores in 2018. He proved to be an electrifying receiver, totaling 571 yards with five touchdowns on 48 career receptions. Jacobs is dangerous on kickoff returns, posting one score and 428 yards last season. Houston made the playoffs at 11-5 as champions of the AFC South, but it carried one of the league’s worst pass defenses. Texans’ head coach Bill O’Brien saw his group at No. 28 in the NFL for this department, allowing a quarterback rating of 92.7 and giving up 28 touchdown passes to forcing 15 interceptions. The franchise is expected to lose former Louisiana State University star, Tyrann Mathieu, as he signed to Houston for one year through 2018. 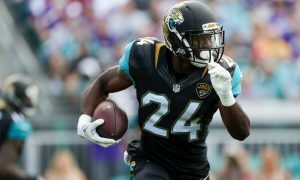 It returns a combined seven interceptions from Kareem Jackson, Justin Reid and Andre Hal; however, bringing a native Texan in Deionte Thompson back home couldn’t hurt. His playing weight of 185 pounds has NFL scouts a little nervous, but Thompson is currently training in California for the Scouting Combine. Should he reach the 200-pound benchmark, all fears will be erased and teams will come to him. As for now, scouts really like his instincts, tackling prowess, coverage skills, and ability to track the football inside the numbers. 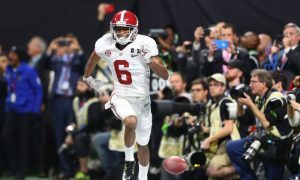 He collected 78 tackles for the Tide and tallied six pass breakups, two interceptions and three forced fumbles in 2018. Oakland is going to allow Jon Gruden to build the franchise his own way, although he may have a strange complex in thinking the league is still in 2002. After trading Khalil Mack and Amari Cooper, he has three first-round picks to work with and Gruden may possibly go defense first. Mack Wilson’s performance in 2018 was not up to his standards by any means; nevertheless, Gruden and the Raiders may reach for him at No. 28 overall. In his lone Super Bowl win with the Tampa Bay Buccaneers, Gruden had a big-play linebacker in Derrick Brooks. Wilson totaled 71 tackles last season and has shown throughout his career at Alabama that he excels in coverage. The Montgomery (Ala.) native accounts for six interceptions and seven pass breakups in his tenure. 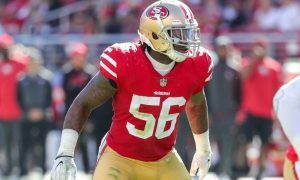 He must improve his tactics in film study and calling signals on the field, yet and still, Wilson’s athleticism makes him a next level linebacker.